Hello everyone, this is a card that is inspired by a character from the Fate/Stay Night series. Cannot be Special Summoned except by its own effect. Requires 3 Tributes to Normal Summon (cannot be Normal Set). When Tribute Summoned: destroy up to 3 cards from your opponent's hand or field. (The card(s) in the hand are chosen at random.) If this card attacks a Defense Position monster, inflict piercing battle damage. During the End Phase of a turn this Tribute Summoned monster was destroyed: you can pay half your LP; Special Summon it from the GY. Design Notes: (The "Berserker -" part of the card's name isn't intended to be an Archetype, just part of the card's title.) My goal when making this card was to try and make a 3 Tribute monster that is hopefully worth summoning. Tributing three monsters is a pretty steep cost, so immediately when he hits the field, his effect allows you to break even and get rid of three of your opponent's cards. 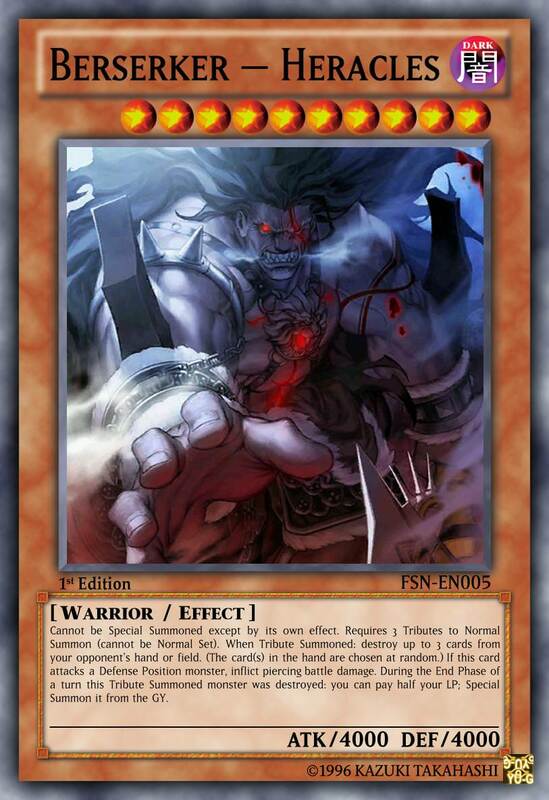 While it's true that there are cards like Beast King Barbaros that can destroy all cards you opponent controls when Tribute summoned, the thing that sets Berserker apart is his ability to hit cards on the field or in the hand. So you can summon him and cause your opponent to dump a good chunk of their hand (possibly even their entire hand) off his effect. Then, if your opponent controls any problem monsters, chances are Berserker's ATK is more than enough to simply run over them in Battle. The interesting thing is, his effect is a non-targeting effect, and since you don't target anything upon its activation, your opponent can't use cards like My Body as a Shield to negate it (in the case of MBaaS for example, its effect protects monsters from destruction, but since Berserker's effect allows it to hit Spells or Traps, or cards in the hand, there's nothing to verify monsters will be destroyed by his effect until they are already destroyed - meaning its too late to activate MBaaS in response). While he's on the field, he's a pretty straight forward beater card with piercing damage. He lacks any inherent immunities to card effects or destruction, but if he is destroyed, he has the ability to Resurrect himself in the End Phase. So, not only can he blow up three of your opponent's cards, your opponent then has to worry about gathering the resources to destroy him not just once, but twice. This is also why he lacks inherent immunities; he initially had a "cannot be targeted" effect, but I was concerned with Balance, so I removed it. He also originally had no limitations on his resurrection effect; so long as you were willing to the cost, he could keep coming back any time he was destroyed. But, I decided this was too far so I added the "...this Tribute Summoned monster..." clause to put a limitation on it. What that means is, after he's Special Summoned by his own effect, he's no longer considered a "Tribute Summoned" monster, therefore you can't Resurrect him again if he, as a Special Summoned monster, is destroyed. Incidentally, he is a target for The Warrior Returning Alive, so hypothetically you could retrieve him with that card and Tribute Summon him all over again... Speaking of which, he originally was going to be a "Tribute 3 monsters to Special Summon this card" like D-Hero Plasma, but decided to slow it down a bit and make him more like Obelisk. Since this card is from an existing Franchise, I'll briefly mention how the actual character inspired the card design. In the series, only the strongest mages can conjure and control Berserker as their servant, thus inspiring his 3 Tribute effect (and the "Pay half your LP" cost of his resurrection effect). In the anime, it is shown that a single one of his punches is powerful enough to shatter through even the strongest knight's armor. This is what inspired his piercing damage effect. And that's not even mentioning how skilled he is with the sword and in hand-to-hand combat, and incredibly agile despite his massive size (hence his big ATK). Also, if Berserker is killed, he has the power to come back to life a total of twelve times, which in itself is a reference to the Greek legend of Heracles (you may be more familiar with the Roman name, Hercules). I know 3 tribute monsters are generally not the most competitive monsters out there, although people did put Obelisk the Tormentor into Frog decks a while back, and that Apoqliphort Tower is a pretty insane card in its own deck. Now that I mention it, Obelisk was a pretty big inspiration on this card's design as well, hence the 4000 ATK and DEF. So, whether Berserker would see that level of competitive play, who knows, though I think players may at least experiment with it. Hopefully, you like the card's design. Would you use it in your deck? What deck would you put it in? I like this card; it's a good card. The text appears to be correct, though I am a bit sketchy about parenthesis inside parenthesis. I guess it could be fine however. As for the card itself, it strikes me as a much more aggressive Obelisk the Tormentor, without any card immunity but sporting non-targeting field and hand destruction. Comparing this on-Summon effect to Obelisk's ability to Tribute 2 monsters and give up the card's attack to destroy all of your opponent's monsters only on the field, Heracles has the upper hand in straight up versatility. Also has piercing battle damage for a plus, which it also keeps when it is Summoned from the GY by its effect. Nice. This card is a great boss monster, and outclasses the Egyptian God cards in aggressiveness, overall available support and sheer usefulness in today's competitive world. I'm not sure if it would do well against the high tier Decks, but I wager it would fit much more snuggly in most Decks that already use Obelisk. Thank you for the feedback, o_smily. Returning to this card in hindsight, I am wondering about how it's worded - do you think that when it says it can destroy up to three cards in the opponent's hand or field, it's clear that that means you can hit two cards on the field and then one in the hand, or two in the hand and one on the field (for a max total of three), or do you think that it can be misread as "you hit three on the field OR three in the hand"? Because, I was thinking of errata-ing it as something like "Destroy up to a total of three of your opponent's cards, in their hand and/or on their side of the field (the card or cards in the hand are chosen at random)." So the effect would be the same, just worded better/different. Thoughts? I think that the wording you have is alright already. However, the other wording is just as effective and might lead to less ruling questions. However, this mostly has to do with the fact you use the words and/or instead of just or. If you were to just change it to and/or on the current text, it would work just as well.